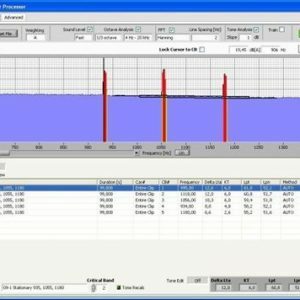 EDM Modal is the complete modal testing and analysis software package from Crystal Instruments. Engineering Data Management (EDM) is a PC-based software program designed for real-time data management and processing. This easy to use, Windows-native software manages the communication between the PC and all Crystal Instruments hardware platforms. 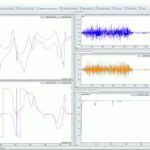 EDM Modal is a complete Modal Testing and Modal Analysis suite for Experimental Modal Analysis (EMA). 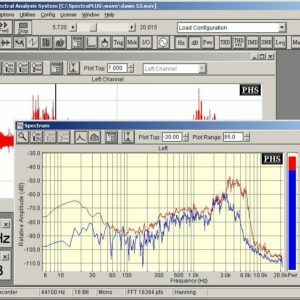 EDM Modal was developed based upon the sophisticated technologies of modern modal analysis theory and technique. With its intuitive controls and powerful features, EDM Modal is the ultimate tool for modal analysis applications. 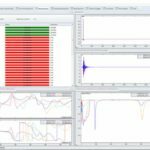 An intuitive interface allows users to manage highly complicated tests that can involve hundreds of measurement points and multiple excitations. This interface also allows for simple tests to be conducted quickly and with little effort. Regardless of how complicated the modal test is, EDM Modal provides exactly the right tools to achieve your goal. To successfully acquire testing data, it is essential to properly book-keep the Degree-of-Freedoms (DOFs) of the test structure. The Geometry Editor handles all types of structure modeling and supports all types of coordinate systems. Using the concept of ‘components’, parts of a complicated structure can be built simply and then integrated into the geometric model. Inside the Input Channel Setup window, the measurement points and their corresponding directions can be defined. Once the test is started, the measurements will proceed through all the test points, as defined by the Degree of Freedom (DOF) information for each measurement point. Modal parameter identification is at the heart of modal analysis. EDM Modal employs several curve fitting methods for modal parameter identification. The Least-Squares Complex Exponential (LSCE) method is implemented for the pole (natural frequency and damping factor) identification of single-reference Frequency Response Function (FRF) cases. For multiple-reference (Multiple Input/ Multiple Output or MIMO) testing cases, the corresponding Poly-Reference Time Domain (PTD) method can be used. With the knowledge of the Modal Participation Factor (MPF) from multiple reference FRF data, closely-coupled modes can be isolated. For mode shape calculation, the renowned Poly-Reference Frequency Domain method (PFD) is used, which is very intuitive. The animation tool is a powerful visualization facility that simulates the mode shapes of the device under test, allowing users to study and understand large amounts of data through a 3-dimensional animated display. The animation module can apply color contours to the surfaces of the geometry model to help visualize deflections in a 3-dimensional space. Free-form Deformation (FFD) enhances the mode shape animation, resulting in smoother and more realistic mode shape displays. Using the same geometry model, Operational Deflection Shapes (ODS) can be displayed using measured time or spectrum operating responses. 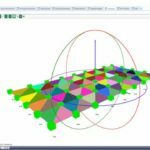 EDM Modal Geometry/ODS/Animation is the primary EDM Modal software module, and is required for every EDM Modal system. This option provides fast and efficient structural model generation and full 3D visualization of test and analysis results. The base elements (points, lines, and surfaces) can be added/deleted graphically, or through typed Model Editor entry. Components can be specified for each part of the structure. Each component can have its own origin, as well as its directions and Euler angles. The basic component library includes: line, plane, cube, cylinder and sphere. Any of these can be added to the geometry model by specifying origin, direction, dimensions, and the number of cells of the component. The geometry model can be saved and later recalled by other tests. Also, the model can be cleared when the user wants to start over with a new geometry model for the structure under current test. Several types of format from 3rd party applications are supported for geometry model import. The Universal File Format (UFF) format of point and line models is widely used, and may be imported to EDM Modal Geometry. One of the most-used features of EDM Geometry is mode shape animation. Several types can be selected, such as ‘point and arrow’, wireframe, or surface contour. The animation’s view mode can be set to single Perspective View or Quad-view (Perspective/Top/Side/Front). One cycle of the mode’s animation can be saved to an .avi file. EDM Modal Operational Deflection Shape (ODS) is a feature that allows users to better visualize the deformation of the structure under test. Time domain data and spectrum data can be animated using the animation feature of the geometry model. It is an integrated feature with the Geometry and works for all types of EDM Modal testing. The database structure of EDM makes it very easy to navigate and select data. The selected data set can be animated using the geometry model. The vibration pattern, either in time domain, or frequency domain, can be saved to .avi video files, too. EDM Modal Hammer Impact Testing provides the necessary features for a single-operator experimental modal test. The Hammer Impact GUI features an intuitive step-by-step process, allowing a user to easily go through the setup and then the testing. The testing process has been designed to help users quickly define acquisition parameters, so that more time can be spent on analysis. Users can define trigger behavior through the Trigger Setup; a Trigger-Preview window allows control over the trigger level and pre-trigger delay. 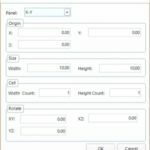 For users that may need to review their measurements after each acquired frame, the ‘Manual-Arm’ trigger mode can be used. When this trigger mode is selected, acquired signals will be displayed for review and will prompt the user to accept/reject the signal. The auto-arm mode simply auto-accepts acquired measurements and automatically re-arms the trigger, helping to speed up the whole test process. 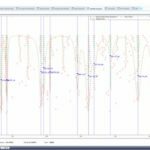 Another implemented feature is Driving Point Selection, which will help users decide where to place the fixed excitation or response reference. 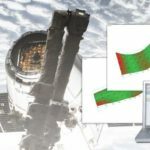 The idea here is to survey several candidate driving-points, and measure their FRFs – this allows you to choose the best available DOF for the driving point. The FRF at the trial driving-point which best excites most of modes can be selected as the driving-point. EDM simplifies the data management for this important pre-test survey. When taking measurements, the status of the DOFs are indicated in a Table window. The status of every measurement point is available from this table, which is updated as the test progresses. The Trigger Preview window is optimized for your viewing experiences – featuring a resizable window and adjustable font size. The font size increases when the window itself is dragged to be enlarged. With this added flexibility of the trigger window, EDM Modal supports users with various display types- users can be far removed from their display and still be able to take measurements. Users have total control of their testing, regardless of how far they are from the computer. One common problem associated with hammer testing is the “double hit”. EDM Modal Hammer Impact software can automatically detect a double hit and give the user the choice to automatically or manually reject the double strike. Hammer impact testing is seamlessly integrated with the necessary post modal analysis inside the EDM software. EDM Modal SIMO FRF Testing includes a dedicated test setup and operation process flow using a single shaker to acquire FRF signals. Using a large channel count data acquisition system (i.e., Spider- 80X or Spider-80Xi), this shaker excitation method provides much higher test execution efficiency for the FRF measurements and minimizes the crest factor of applied forces. The Source Output type supports pure random (white noise), burst random, Chirp/Burst Chirp, pseudo random, and periodic random. For periodical random types (pseudo random and periodical random), the delay block and cyclic block numbers can be set for the purpose of bringing the structure to steady state response prior to each data acquisition. This will result in leakage-free measurements that do not require the use of a tapering window function. 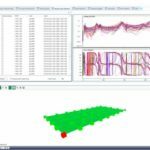 The modal analysis process is seamlessly integrated with the MIMO FRF testing. EDM Modal MIMO FRF Testing includes a dedicated test setup and operation process flow using multiple simultaneous shakers to acquire FRF signals. 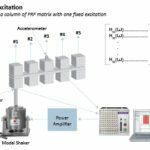 Using a large channel count data acquisition system (i.e., Spider- 80X or Spider-80Xi), this shaker excitation method provides much higher efficiency and accuracy for the FRF measurements while minimizing local stresses on the test article. When using multiple shaker random excitation applications, the shaker-driving Source signals are guaranteed to be uncorrelated with one another. The Source Output type supports pure random (white noise), burst random, chirp/burst chirp, pseudo random, and periodic random. For periodic random types (pseudo random and periodic random), the delay block and cyclic block numbers can be set so that the structure exhibits steady-state response, allowing precise window-free analysis. Multiple shaker excitation is useful to separate and clearly identify repeated roots and frequency-proximate modes. With more than one reference shaker, multiple columns of the Frequency Response Matrix can be measured simultaneously. Combined with the poly-reference curve fitting algorithm, the modal participation factor will help to isolate the repeated and highly coupled modes. 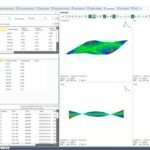 EDM Modal Standard Modal Analysis provides the user with a complete arsenal of tools, from FRF data selection and parameter identification to results validation and mode shape animation. Upon completion of the Modal testing, the set of FRF data is made available for the next step: Modal Analysis. You can also add/replace individual FRF signals. The complete set of FRF test signals can be exported, or imported from other sources. These operations are managed by ‘Modal Data Selection’. 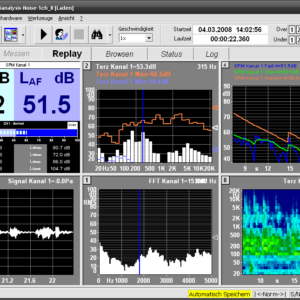 The FRF signals are organized for a rapid comprehensive review, one by one, or multiply in one graph window. With one click, the Modal Parameter Identification process can be started. With the help of a Mode Indicator Function (MIF), the natural frequencies can be labeled. The Multivariate, Complex, Real, and Imaginary Sum MIFs are available. MIF indicators aide identifying repeated roots (repeated poles) and closely-space distinct roots. A Stability Diagram is employed with modal parameter identification. With the Standard Modal Analysis option, the proven Least Square Complex Exponential (LSCE) fitter is implemented for pole identification. The physical poles sought are stable (as opposed to ‘computational poles’ sometimes produced by the LSCE) and can be selected from the Stability Diagram for the next step mode shape calculation, using the Least Square Frequency Domain (LSFD) algorithm. The resulting mode shape table can be saved and used for mode shape animation. Modal Assurance Criterion (MAC) function and FRF synthesis are also available. These provide means for modal parameter validation. 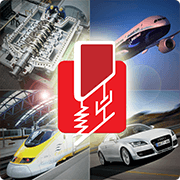 EDM Modal Advance Modal Analysis includes all the features of Standard Modal Analysis. On top, it provides the Poly-reference modal analysis algorithm to curve fit the FRF matrix from the MIMO FRF testing results. The time domain curve fitting algorithm for the pole identification is Poly reference time domain method (PTD), which is sophisticated and proven. The selection of the curve fitting method, PTD or LSCE, is automatic based on the type of FRF signal set selected, whether it is single reference or multi reference.